Tsugami, the editor-in-chief of a newspaper in war-scarred Osaka, agrees to sponsor a bullfight. For months this great gamble consumes him, makes him as wary and combative as if he was in a ring himself. And, as he becomes ever more distant, his lover Sakiko is unsure if she would like to see him succeed or be destroyed. Yasushi Inoue's novella won him the prestigious Akutagawa Prize and established him as one of Japan's most acclaimed authors. From the planning of a bullfight—through Tsugami's struggle, his focus and his aloneness—he crafts something intensely memorable, a compelling existential tale. Pushkin Collection editions feature a spare, elegant series style and superior, durable components. The Collection is typeset in Monotype Baskerville, litho-printed on Munken Premium White Paper and notch-bound by the independently owned printer TJ International in Padstow. The covers, with French flaps, are printed on Colorplan Pristine White Paper. Both paper and cover board are acid-free and Forest Stewardship Council (FSC) certified. 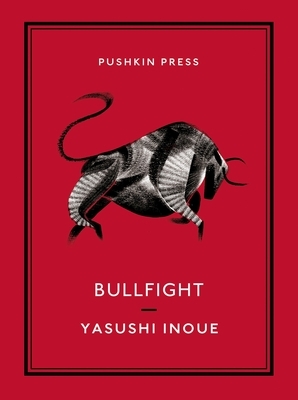 Born in 1907, Yasushi Inoue worked as a journalist and literary editor for many years, only beginning his prolific career as an author in 1949 with Bullfight. He went on to publish 50 novels and 150 short stories, both historical and contemporary, his work making him one of Japan's major literary figures. In 1976 Inoue was presented with the Order of Culture, the highest honour granted for artistic merit in Japan. He died in 1991.